Nadi Legends Club (Fiji Soccer): SOCIAL HISTORY: "The Restaurants and Nightclubs of Old Lautoka", by Henry Dyer, 16 April 2015. The Restaurants and Nightclubs of Old Lautoka. By Henry Dyer and Kieran James. Lautoka has changed. Today there are new buildings as compared to the colonial buildings of the first business houses. There were only a few Chinese people before at that time. I remember Eddie Hin and Kum Poi. I was brought up with some of them then in the early-1960s through to the 1970s. We went to church with most of the Chinese community at the Evangelical Fellowship Church which was located just beside Jasper Williams High School. The church still stands today. The pastor then was Pastor Cairns. His son, Pastor Cairns Junior, took over. This is when I learned about the Chinese community at an early age as I became friends with them. One of the Chinese children (Graeme Leung) became the chairperson or president of the Law Society. Henry Dyer @ Renee's Pub, Naviti St, Lautoka, 6 March 2015. Most of the Chinese restaurateurs have moved on to different businesses. One of the restaurants then was Yang’s, located beside the Globe Theatre. The Globe Theatre was located on the corner of Naviti Street and Vakabale Street just opposite Jolly Good Restaurant and the market. A Chinese provision and lolly shop is located there today. Yang’s Restaurant was located around three stores away from Globe Theatre, further down on Naviti Street (in the direction towards MH and Nan Yang Seafood Restaurant). Business in Lautoka then was very slow compared to today. Inside the Filipino tailor shop today (opposite the market on Vakabale Street) you can still see the stairway which used to lead up to the Globe Theatre. The restaurant called The Great Wall of China Restaurant on Naviti Street (opposite Renee’s Pub) was not open then. Those Chinese came in later although now I have heard that that family claims to be the leader of the Chinese community in Lautoka. There was also the Crown Theatre. It had wooden walls. It is where Infashion store is located today on Vitogo Parade. It was really old when we started going to cinemas then. I don’t know for how long it had been standing before I was born in the early-1960s. The third cinema was the Mayfair Theatre which was located where Village 4 is today. Crown Theatre closed down a long way back, years before the Globe Theatre closed. This was probably due to its age. It might have been difficult to resurrect it. 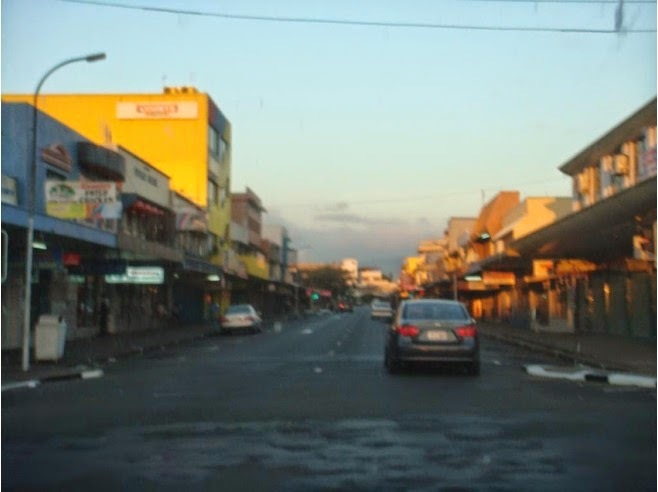 There were only two curry house shops in Lautoka, Narsey’s and Bombay Lodge. 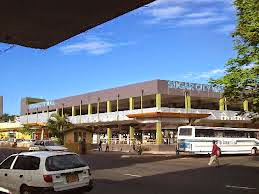 Narsey’s was located beside the Pacific Transport Headquarters which is now one of those big takeaway restaurants in Lautoka. Narsey’s was located on Yasawa Street; it was about the sixth shop from the corner and opposite from the bus station. At Narsey’s they had a variety of curries and they were the best in town then. I remember, because when I first worked as a dockworker at Lautoka Wharf (age 17) when I got my pay (around $17-per-shift which was big money), I used to see the drift of the dockworkers towards this curry house. This is how and when I got my first taste of curry restaurant food in Lautoka. Today this restaurant is still there but with a different owner and a different name. Back then to have a meal away from home was like going to America and coming back. It seemed like that to me then as a child. There were other curry houses such as Bombay Lodge on Naviti Street (opposite Sugar City Mall) but Narsey’s was a famous place and everyone was heading there. Yang’s Restaurant was the top-class restaurant in Lautoka then. They would fix the dish up with real Chinese spices. It was a top-class restaurant and not just a café or takeaway shop. There was another Chinese restaurant, Eddy Hin’s. They still have this restaurant but I don’t know who the owners are now. Nan Yang Seafood Restaurant is located in the same shop too. There were only two Chinese restaurants back then. More people went to Yang’s probably due to its location near to the bus station, the centre of town, and the taxis. At that time the Indian community was very closely-knit. They did not mingle with the (indigenous) Fijians much perhaps due to fear of discrimination. It was very hard to play soccer on the field with the Indian children. They had a soccer ball and you would sit on the side-lines waiting to play and they would say “no Fijians” perhaps because we were perceived to be stronger and rougher. At night you would seldom see an Indian on the street compared to nightlife today. They have opened up to this side of life much more now. The dress style of the young Indian girls today is different. Back then you would not see girls wearing tight jeans or long pants. They used to just wear Indian clothes such as saris. If you saw an Indian girl then in long pants everyone would look at her and you would hear the passing of remarks. At that time I am sure that the Indian population of Lautoka was significantly higher than it is today because of emigration. There were only four nightclubs in Lautoka. The oldest of them all was Raymond’s Night Club. Today it is a warehouse building connected to the wharf. It was right at the edge of the gate to the wharf. This nightclub had a balcony where you could look out towards the Bekana Island, Namoli Village, and beyond. This nightclub was the meeting-place for the local (indigenous) Fijian crowd. The owner was Raymond Wong. His son is Patrick Wong. He is one of the tourism big boys today. As at February 2007 he was the general manager of Matamanoa Island Resort and in 2009 he was Tourism Fiji chairperson. Patrick was a former boxing champion in bantamweight. We used to go to this nightclub just to see what life was like after nightfall. It used to close around 1:00 a.m. It shut down around the same time as Globe Theatre or just prior to that. This would have been in the late-1970s or early-1980s. It was very similar to the atmosphere you find today at Deep Sea Nightclub in Nadi or Renee’s Pub in Lautoka. People who have money take the floor and those who go to watch stand aside and wait for the chance to push their way in and take advantage of the benefits. This was just a joke to us as youth. We would sit back and watch how things worked in the nightclub. We just wanted to get a buzz before we went home. I remember I was there one night because I wanted to see what life was like in a nightclub. My uncle (Eneri Ratudradra) was a rugby player for Lautoka then. When he saw me he said: “Hey nephew, come here.” I thought he was happy to see me. This was in the nightclub. He asked me who I had come with. I said: “With my friends.” Then he pulled out his belt and he said: “I want to see you go down these stairs and then run home to the village.” He was referring to Namoli Village where I then lived. This did not deter me as we had quite a large group and we would always move together (either to play sports or to go to functions or to see what nightlife was about). Club 21 closed down before Whiskey Town. The location was opposite where Great Wall of China Restaurant is now (on Naviti Street). I think it is upstairs from next to the Chinese phone shop called Dickson’s. There was an indoor spiral staircase up to it which is still there today. This was a nightclub for the young working generation and the school-children. By contrast, Whiskey Town was for the villagers and the local (indigenous) Fijian community. Club 21 had a very good atmosphere because all communities around Lautoka met there. This is where the young generation, which schooled in various places around Lautoka, came to meet up with each other in the evenings. I used to go there when I was in Ba Provincial Secondary School and later. Ba Provincial Secondary School was located at first where the present Housing Authority Office is today (beside Coronation Church). When I studied at this school it had already moved to its present location. Club 21 was very lax in checking whether you were of drinking age. You just had to look smart and act smart. There were fights there also. Sometimes old rivalries would lead to fights (for example, Waiyavi boys versus Topline boys). (Topline is a suburb on the outskirts of Lautoka.) This was a meeting place too during the eight-week school holidays. It used to be absolutely jam-packed. This nightclub was for all communities but it was mainly patronized by the (indigenous) Fijians and the part-Europeans because the Indians tended to stick to themselves. There were no Indian nightclubs then. The only place that the Indians went to occurred much later. It was opened just a few years back. That is the nightclub opposite the Sugar City Mall on Naviti Street. At that location there used to be the Galaxy Nightclub although it came later than the other nightclubs already mentioned. It only opened in the late-1970s. It was for the upper-class. It had a new type of dance-floor, lights underneath the floor, and the flickering balls which lit up the walls. Galaxy Nightclub was also mostly for the Fijians and the part-Europeans. It was later one of the busiest places of them all. In that central location the transport and the food were easily accessible and this factor ensured its popularity. None of the restaurants open now in Lautoka were open back then. Tigers and Jolly Good have only been there for a short period of time (perhaps eight or nine years). I used to go to Lautoka Club but not all that often. I would go there for a drink or for special functions. Sports and Social was another nightclub. At that time there were four nightclubs – Raymond’s, Whiskey Town, Club 21, and Sports and Social. Galaxy was opened after Raymond’s had closed down. Sports and Social Club was meant for the sports people of Lautoka. It was designed as a place for sportspeople to gather after matches. Sports and Social Club was located right beside Churchill Park. It was a building just to the right of the ticket booth at the Churchill Park main entrance. The building has since been demolished. It was where all the sportspeople and people from all sectors of life would meet together after the game and they would stay there until it was time to head home. We enjoyed meeting with the older generation of that time as they enjoyed us serving their beers and we would show respect to them. It gave them a touch of youth again. I remember old George Farrell, Alosi Johns and her husband David Johns (my uncle), Mrs Millie Ah Tong, and Dr Tuidraki. They were the regulars of the club during that time. Kieran James, Henry's eldest son "Fella", and unknown, 2014. The Sports and Social Club was for the older working crowd. This was their pub. The younger generation sometimes would spill over and mingle with the older guys in the hope of receiving more beers because the older crowd, then as now, had more money. Sports and Social was where the younger generation would look to. It was a Nadi Club type of place but for the matured (indigenous) Fijians. It was patronized by government workers and private-sector workers. There were fights there sometimes when the older respected citizens were not around. The fights used to be extremely brutal because there were two empty streets and a whole playground to use for fights. You had to either fight or run for your life. We used to enjoy it. We would stand on the sugar-cane tramlines and watch. We would see people run or get knocked out. This club was open during the daytime as well. At one stage food was available but then that was stopped. People were very sad when this club closed. This was one of the saddest moments for Lautoka as it was owned by the locals. Even today, when I walk past that place, the memories keep coming back. It has been demolished for over ten years now and nothing has been done. I hope something can be done to resurrect it again. Paolo Nawalu and Henry Dyer @ Namoli Village, 2014. Club 21 changed its name to Great Wall of China. Now I see a restaurant in Naviti Street called Great Wall of China and I assume that they borrowed the name from the nightclub and/or that there were some connections through maternal links. The real Great Wall person was Raymond Wong (Patrick Wong’s father) who also owned Club 21. Patrick Wong is in the tourism sector now. At one time he was managing one of the island resorts. I am really not sure where he is now. Yang’s Restaurant was owned by Alfred’s family and Eddie Hin’s restaurant was owned by, of course, Eddie Hin. He also had a lemonade / soft-drink company. There was a Chinese restaurant in Eddie Hin’s building on the ground floor. I don’t remember the name of the restaurant. There was a small milk bar there at the entrance to the restaurant. Many Fijian ladies were working there. This restaurant was open from the mid-1970s to the early-1980s. It may even have existed as far back as the 1960s. I used to go there sometimes when I was a young schoolboy at Drasa Avenue School. (I left Drasa Avenue School in 1975.) I would have a milkshake there for 20 cents. You could sit inside the shop and have a milkshake. There was another milkshake restaurant owned by a Gujarati family called S.B. Maharaj. It was located near the Crown Theatre, opposite the hockey grounds. I would meet with other schoolchildren there to have a milkshake. If I had 20 cents spare I would stop there after school to have a milkshake with other Drasa Avenue schoolchildren. Today that milkshake would cost $3 or more. The milkshake glass was very tall and very wide (perhaps nine inches by four inches). If I had 40 cents I would have two. It would take until dinner to finish the two milkshakes. I used to enjoy sipping them very slowly. Things back then were very cheap. Other nightclubs opened and closed but they did not have the longevity of the four clubs I have mentioned plus Galaxy Nightclub. At one time there was a lack of nightlife in Lautoka. This was during the mid-1980s. The Sport and Social Club closed around 13 years ago. Before these nightclubs closed people from as far away as Ba, Tavua, and Vatukoula would come down to Lautoka because it was a city. They would enjoy the nightlife and spend the night there. That same crowd from the 1980s then gravitated to Nadi because Lautoka’s nightlife had died. By this time I also had moved to Nadi. The crowd would travel from Tavua to as far away as Nadi just to enjoy the nightlife. By that time (late-1980s) the tourism industry in Nadi had just started to boom. Lautoka now has a lot of nightlife again. The community has changed its approach to life. People have become friendlier amongst themselves. The present nightclub at Lautoka Hotel (now called Hunter’s Inn) opened sometime during the early-1980s. It is called the Qara Vatu (in English: the Tomb). I remember going there. It was a different style to the other nightclubs. It had a different atmosphere as it appeared that you were really in a stone cave. There were lights, music, and a bar. We used to frequent this place only when we had money. Now the place is for anybody; before it was mostly for the young (indigenous Fijian) crowd from the nearby villages and communities. They all respected each other until it started getting a bit rowdy. My memory is strongest of the places I went to when I was very young which includes neither the Galaxy nor the Tomb. There was also a nightclub which opened up in the Namoli Industrial Area (at the back of Namoli Village and close to the sea). This nightclub was also an attraction but unfortunately it did not last for long. This place was frequented mostly by the villagers and the other (indigenous) Fijians. It only lasted for around four or five years. It was great to have a night out there because you had a view of Bekana Island and the lights of the Lautoka Wharf; and you had the breeze. It was owned by a local. I do remember that beer was cheap there. I had a lot of friends there as I grew up in Lautoka. I used to really enjoy the nights there. This nightclub was opened much later, around the mid-1990s. Sometimes I would visit because I would frequently go back and forth between Nadi and Lautoka. Since I grew up in Namoli Village I always retain a strong attachment to Lautoka. I have my mother’s family residing there too. Kieran James and the mother of Henry Dyer @ Namoli Village, Lautoka. 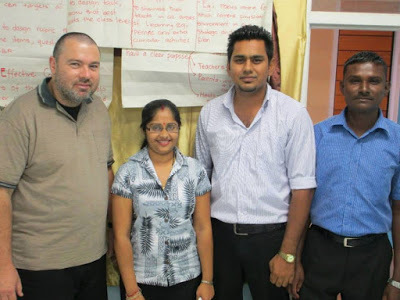 Left to Right: Paolo Nawalu, Kieran James (University of Fiji), and Henry Dyer @ Namoli Village, Lautoka, 2014. Interesting article to read and going back in time. The restaurant in Eddie Hin Bldg was called "Luke Bo Restaurant". One of the chef was Jimmy.